Schubert remains a 'modern' composer even nearly 200 years after his death. The Schubert we experience in this great body of quartets, 'wandering into far-off lands' and 'divided by love and pain' has as much to say about our condition in the 21st Century as it did to his close circle of friends in Vienna. It was in this spirit that we set about making this live recording, in hopes that a listener beyond the limits of that hall on those nights would join us in discovering these great works anew. Blu-ray + DVD + Book (28 pag.) + Voucher Code to download the video in HD MOV (H.264). Franz Schubert’s fascinating legacy of music for string quartet reflects two distinct stages in his creative development. While still a teenager, Schubert wrote numerous quartets, which display a resourceful treatment of compositional models. He gained valuable experience through playing viola in the family string quartet with his violinist brothers Ignaz and Ferdinand while his father played violoncello. Still more importantly, he played violin in the orchestra of the Vienna City Seminary (Kaiserlich-königliches Stadtkonvikt), and surely sometimes led the ensemble. 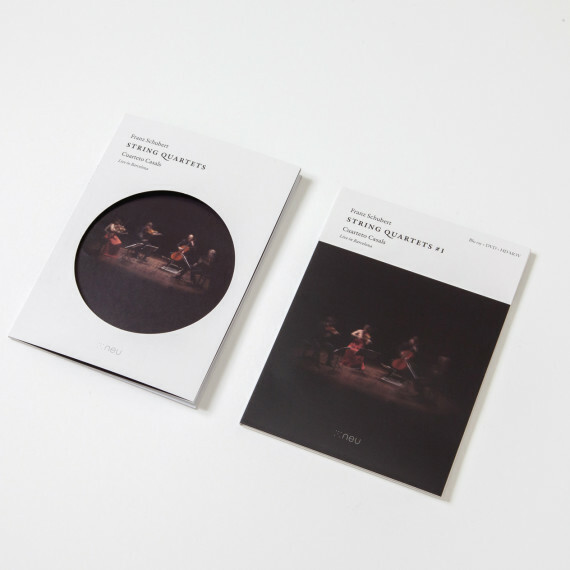 Schubert originally composed fifteen quartets up to 1816 but some were lost or remained incomplete; the present comprehensive recording includes eleven of his early quartets. Later, during the last decade of his tragically short life, Schubert turned repeatedly to the genre of the string quartet for some of his most original and profound musical statements: the Quartettsatz in C minor (1820), and the last three quartets, in D minor (1824), A minor (1824), and G major (1826). In 1824, Schubert looked back critically to his earlier quartets and even discouraged his brother Ferdinand from playing them, writing that “. . . it would be better, if you concentrate on other quartets than mine, for there is nothing to them.” Nevertheless, there is much of interest in these attractive compositions, and we best understand Schubert’s later detachment from them as a natural consequence of his self-conscious breakthrough to a new and original style of instrumental music during the 1820s. 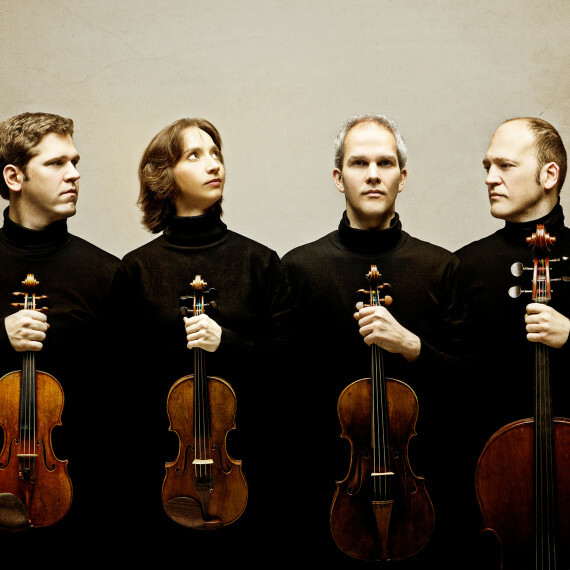 The early string quartets display an affinity to orchestral styles and models. Indeed, the slow movement and finale of his Quartet in D Major, D. 74, themselves provided a springboard for the corresponding movements of Schubert’s First Symphony, D. 82, a piece in the same key completed just a month after the quartet. The compositional models for the early Schubert quartets include Mozart and Haydn, the opening movement of whose Symphony No. 78 in C minor influenced the finale of Schubert’s Quartet in C Major, D. 32. On the other hand, the first movement of Schubert’s Quartet in B-flat, D. 36, absorbs conspicuous references to the trumpet calls from Beethoven’s third Leonore Overture. 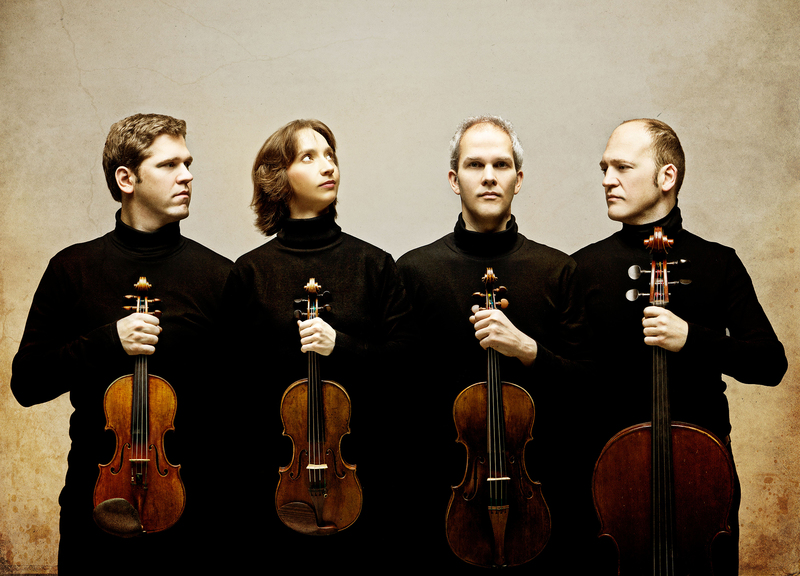 The String Quartet in E-flat major, D. 87, illustrates characteristic features of this earlier style. The opening movement begins with gentle statements of ascending stepwise motives rising from E-flat in the first violin, supported softly by the other instruments. An asymmetry of phrasing enriches the opening 14-measure statement, which is then repeated forte, with echoes and embellishments, before the music proceeds into a transition, with flowing figuration in the viola intensifying the textures. Distinctive rhythmic patterns connect the various themes to one another, while a conversational aura invests the music. The quiet stepwise rising line from the outset of the first movement reappears in different guises in each of the ensuing movements. The humorous, ebullient scherzo places stress on the rising steps from E-flat to F and F to G, with these initial notes elongated and underscored through vigorous accented harmonies. The main melodic pitches are approached here by leaps from above, as crude donkey snorts replace the mysterious pianissimo quality from the beginning of the quartet. The thoughtful Adagio that follows reshapes the two-note motives from E-flat to F and F to G in accordance with its meditative character. In the Allegro finale, on the other hand, Schubert emphasizes the initial downbeat on E-flat in both the first violin and the cello, with the other instruments supplying swift figuration in the middle of the texture. The opening four-measure phrase of this final movement reshapes the initial three-measure phrase from the first movement, with its stepwise rising sixth from E-flat to C reincarnated in vivacious fashion, including insertion of a chromatic E natural as the second pitch of the rising line. The importance of this experiential duality first becomes evident in Schubert’s Lieder. Among the earliest examples are the two famous songs to texts by Goethe from 1814–15: “Gretchen am Spinnrade” and “Erlkönig”. In the first there is a realistic, outwardly-orientated accompaniment, which evokes spinning but also points to Gretchen’s troubled mood. At the climax, the repetitious motoric motion of the accompaniment is interrupted and only hesitantly set into motion again. In “Erlkönig”, by contrast, the internal perspective, which is only subtly alluded to in “Gretchen am Spinnrade”, becomes the central dramatic aspect of the song. For Schubert, the seductive vision of the Erlking is the boy’s, not the father’s. The psychological depth of the setting is made possible by a sudden alteration of perspective in the music, whereby Schubert does justice to the visual dimension of the poem as well as the inner subjective experience of the boy. As harbinger of death, the Erlking addresses the boy with beautiful melodies; only here does the agitated character of the music yield to lyricism. The contrast between the inner perspective – the vision of the boy – and the turbulent outer perspective is intensified through unexpected modulations and sharp dissonances as an expression of the response of the frightened child. Schubert gradually recognized how such strongly contrasting dramatic levels could be assimilated into his instrumental music. A key work in this regard is the Quartettsatz in C minor, D. 703, of 1820, the first of several fragmentary masterpieces of these years. 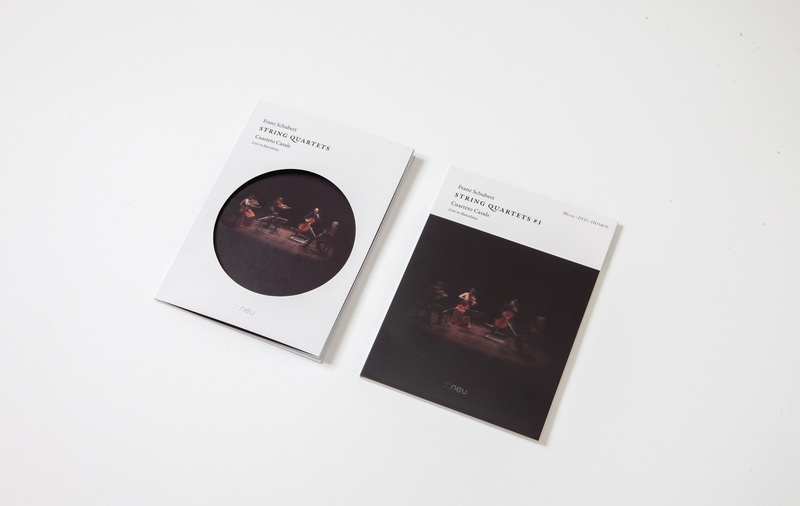 The agitated darkness and chromaticism of the Quartettsatz are somewhat indebted to Beethoven and Mozart, but the execution is Schubertian through and through. The Quartettsatz begins with four imitative entries of an ominous theme full of chromaticism building with intensity to the emphatic dissonance in measure 9. A variation of the theme, which appears three bars later, leads to a contrasting lyrical subject in the submediant, A flat major, that is marked “dolce”. It develops as a twelve-measure section which is repeated and then extended. In this passage, the expected cadence leading to the repetition of the phrase is avoided (in bars 49, 53 and 59) before being asserted with a structural sforzato (view example). The cadential close coincides with the sudden disappearance of the lyrical theme and the resumption of the minor tonality. It is marked by thematic material related to the opening of the movement. Schubert’s characteristic use here of a tri-thematic, three-key exposition, whereby the contrasting second theme commences and closes abruptly, is the outcome of an blending of dramatic and lyrical elements, an approach that evokes associations with the wanderer symbolism of his songs. On 31 March 1824 Schubert reported to his friend the painter Leopold Kupelwieser that “With songs I’ve done little that is new, but I’m trying with instrumental pieces, for I’ve composed two quartets…” His impressive Quartet in A Minor, D. 804, had been premiered just two weeks earlier by Vienna’s leading professional quartet, the ensemble led by Ignaz Schuppanzigh, and this quartet remained the only major chamber composition that was published during Schubert’s lifetime. It bears a suggestive connection to his vocal works. The melancholy character of the figuration and melodic writing in the opening Allegro ma non troppo recalls “Gretchen am Spinnrade”, whereas the minuet immediately quotes motives drawn from Schubert’s song “Die Götter Griechenlands” (“The Gods of Greece”), a Schiller setting from 1819. The text in question is “Schöne Welt, wo bist du?” (“Beautiful world, where are you?”), a poignant expression of the quest of the wanderer figure with whom Schubert doubtless identified. Schiller’s poem continues that “Ach nur in dem Feenland der Lieder/Lebt noch deine fabelhafte Spur” (“Oh only in the fairy land of song/does your legendary trace remain”), another expression of that intense yearning that invests Schubert’s music. 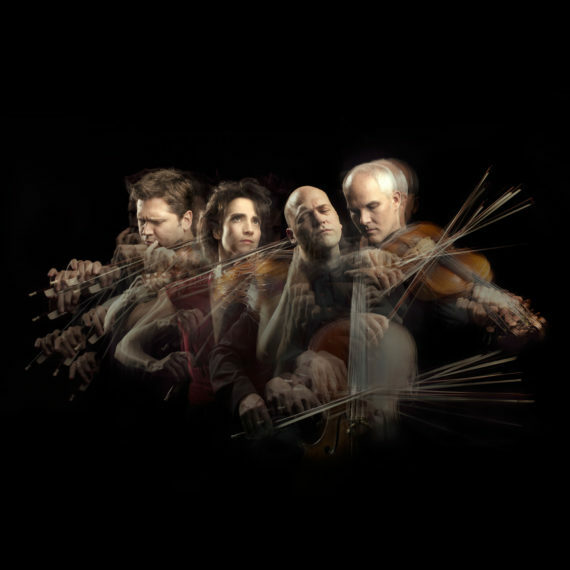 The nickname “Rosamunde” attached to this quartet derives from Schubert’s re-use in the Andante of a theme drawn from the incidental music for Rosamunde, D. 797, from 1823. The second of the two quartets is the work in D minor, D. 810, whose Andante con moto is based on variations on the 1817 song “Der Tod und das Mädchen” (“Death and the Maiden”) to a poem by Matthias Claudius, D. 531. The song involves a dialogue between an anxious girl and the calm, implacable voice of death; the latter supplies the material for Schubert’s Andante con moto theme. Nevertheless, the human victim’s passionate presence haunts the expressive vocal inflections of the first violin in the first variation. At the center of this movement lies the expressive contrast between the powerful fortissimo variation (no. 3) -with its relentless diminution of the fateful long-short-short rhythmic pattern- and the ravishing beauty of the ensuing pianissimo variation in G major. 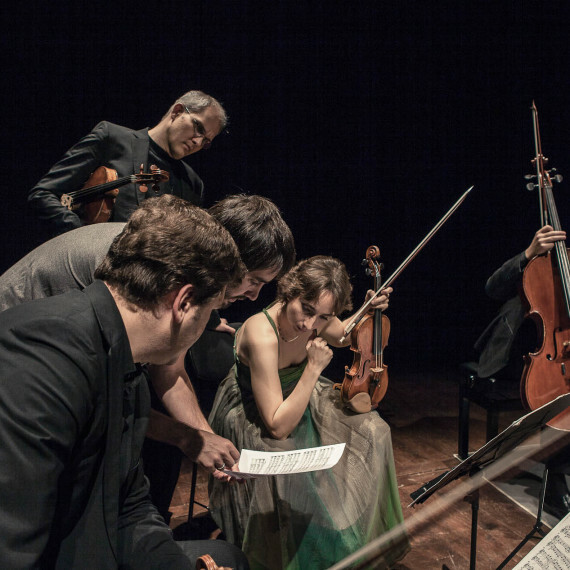 The fierce drama of the quartet’s beginning derives from Schubert’s insightful combination of two elements drawn from the song: the figure of repeated notes that accompanies the girl’s utterances, on the one hand, and the stepwise descending fifth which in the song conveys her final words but which in the quartet is transformed into the fortissimo opening gestures spanning D-G and A-D, on the other. This five-note repeated motive forcefully contradicts her poignant repeated plea to her adversary, “und rühre mich nicht an” (“and don’t touch me”), reminding us that the quartet’s expressive links to the song extend far beyond the slow movement variations. Another connection to death surfaces in the presto finale in 6/8 meter suggestive of a galloping horse, a macabre movement whose lyrical episodes in major keys suggest the coaxing, seductive promises of the Erl-king. The massive Quartet in G Major, D. 887, from 1826, is one of the most audacious and exploratory of all his compositions. Here Schubert carves original thematic material out of the very bedrock of the tonal system. The opening crescendi on major triads seem to shatter these brighter sonorities into the minor, with broken accents following each explosion. Yet Schubert’s treatment of these concentrated gestures also spans vast distances in the overall musical form: at the recapitulation of this Allegro molto moderato, he inverts the modal progression to its opposite (minor shifting into major), profoundly transforming the expressive character. In its treatment of sonority, this movement is particularly resourceful, with uncanny tremolo figures and jarring dynamic contrasts. The sensuous lyrical episodes in the second subject area of the sonata form are repeatedly exposed to ambush by darker, turbulent music in minor keys. The last two movements are similarly rich in contrasts. The brilliant spectral scherzo is joined to a gentle Ländler dance as trio, which acts as an oasis of serenity. In the perpetual motion finale, the shadow of the minor lurks over the main theme in the form of an accented B flat in the first measure, and near the conclusion, a broad crescendo to triple fortissimo powerfully exploits the characteristic textures of repeated notes to assert G minor for the last time in the work. Most pathbreaking, however, is the Andante un poco moto of this final Schubert quartet. This Andante assumes a slow processional character, with transparent sonorities and a wonderful narrative quality given to the cello. Yet the idyllic character is insecure and fragile, as if dependent on human subjectivity that is bound to be undone by the intrusion of the external world. The episodes in this movement are marked by dread, as agitated and even chaotic gestures intrude, with tremolo textures unmistakably reminiscent of the opening movement. Restless delirium is felt; a high, shrill outcry on G and B flat cannot be dispelled even when the tremolo harmonies below it shift in search of solid tonality. 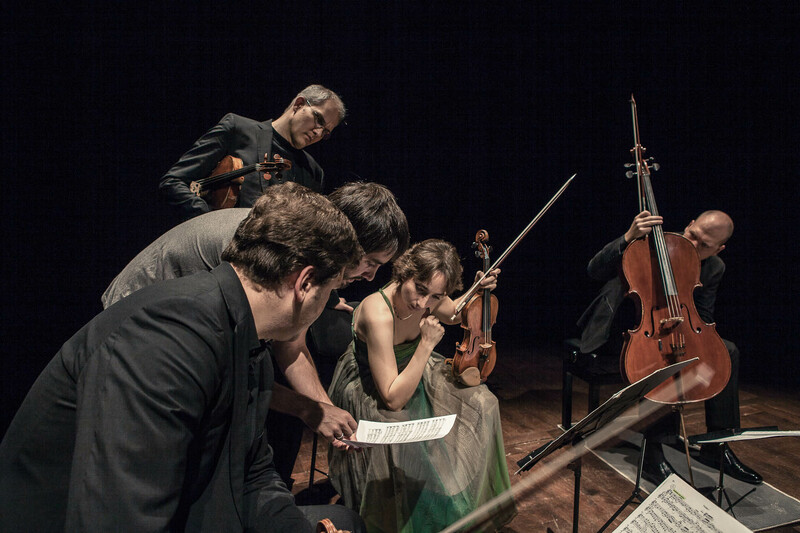 This unforgettable Andante, and the entire G major Quartet, remind us how Schubert’s art blends antithetical elements, exploring qualities of experience seen from a vantage point whose divided perspective encompasses both external perception and the inward imagination.